As promised in yesterday’s blog , “Beating the Bluebook Blues,” today we’ll be sharing some tips on how to keep track of all your citations and some Bluebooking shortcuts. When you’re writing a paper or doing a research project or assignment, it can be difficult to keep track of all the resources you may want to cite. Realized you read the exact thing you needed several days ago, but then can’t find it again? Gotten to the end of writing a paper and remember you still have to do a works cited/bibliography? Wish there was a way to have all your research neatly organized? Wished for help with putting citations into Bluebook format? Then a citation management program can help! We’ve blogged about citation management before , but it bears repeating. RefWorks: a web-based program that allows you to create and share databases. With any of these citation managers, if you come across a book, article, website, or other resource you might want to cite later, keeping it for future reference is (in most cases) as easy as a click of the mouse. EndNote is a little pricey, and we’re big fans of free stuff here at the Law Library, so let’s compare RefWork and Zotero. 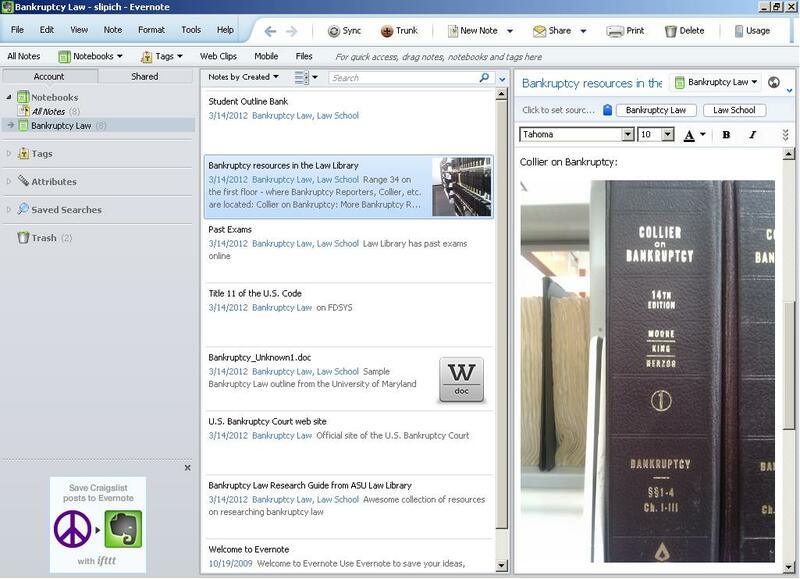 Both of these programs have add-ons that you can install in a word processor, allowing you cite while you write, and both offer some assistance putting citations into Bluebook format! Can I share my research? Yes, you can share a folder or your entire database of researchby allowing permission, then emailing a URL to recipients. Yes, by creating or joining a research group. Does it do Bluebook? Yes, RefWorks will export citations into Bluebook format.Always double check your citations! Yes (requires separate download). Bluebook format is still under development.Always double check your citations! 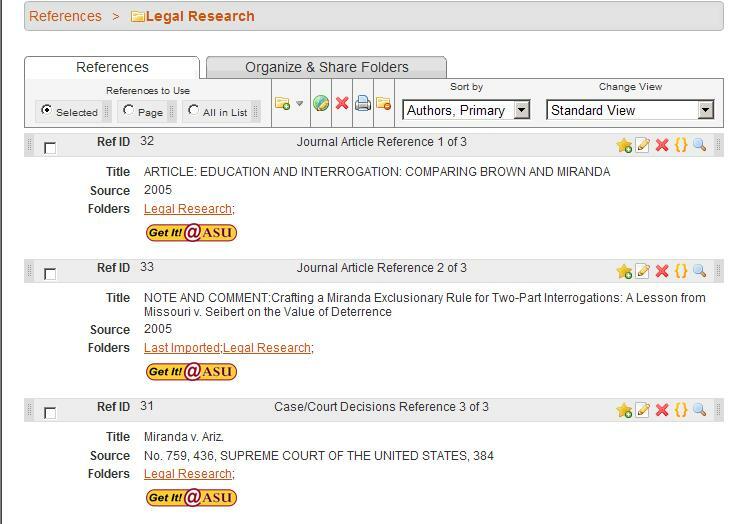 In either program you can manually enter citations from anywhere, including Westlaw and Lexis (unfortunately no citation manager is one-click-compatible with them). 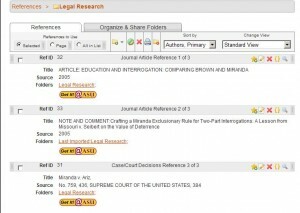 However, RefWorks is compatible with LexisNexis Academic. Don’t forget, if you need help, you can always Ask a Librarian! This entry was posted in Computer Tips, Law Students, Legal Research & Writing on September 20, 2012 by Sara Lipich. If you’re a Smartphone or tablet computer user, you know there’s an app for just about everything! Here at the Law Library, we may have a lot of books, but we love technology, too! So, we put together a list of some of the apps we think are useful to the legal community in our new Legal Apps Research Guide. There are lots more legal apps available out there, so have fun exploring! And here’s one of our favorite tricks: add your favorite websites to your Smartphone or tablet computer home screen so you can access them by touching an icon – just like an app! Find your favorite website (such as the Law Library’s mobile site) with your web browser, bookmark it, then add a shortcut to your home screen for one-touch access. This entry was posted in Computer Tips, Law Library News and Events, Law Library Resources on June 6, 2012 by Sara Lipich. Get Organized Over Spring Break! If you’re lucky, Spring Break means lounging on a pristine sandy beach, sipping a fruity drink from a coconut. If you’re a law student, Spring Break probably means that you’ll be outlining and gearing up for exams. While we can’t transport you to a tropical locale, we can show you few tools that might help with your studies. GTD programs built around this theory, aim to give you a place in The Cloud to “brain dump,” organize your thoughts, and break them into manageable chunks. So, here are some ways you can get your head into The Cloud! Dropbox Tired of emailing files to yourself? Check out Dropbox, which lets you store documents in The Cloud and access them from any device. Watch this short Dropbox In Plain English tutorial for more information. Google Docs Tired of emailing files back and forth between yourself and your study group? Check out Google Docs. A document is stored in The Cloud, and everyone you share it with can collaborate on it together. You can work on it synchronously or not. You can add comments so you can come back and resolve issues later, or use the chat function for side discussions. This Google Docs In Plain English tutorial will tell you more. 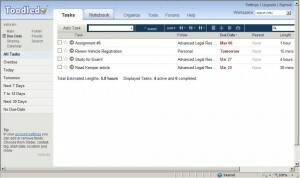 ToodleDo ToodleDo is great if you have a lot of tasks to complete and/or need help prioritizing and managing your time. You can set reminders, sync with calendar programs, and send emails to your ToodleDo list. You can estimate how much time tasks will take, then when you have a bit of free time, let ToodleDo know how much time you have, and it will tell you what tasks you should focus on.Our Acquisitions/Serials Librarian Kerry Skinner is an avid ToodleDo user and shares this advice: ToodleDo has a bit of a learning curve, so to really use it as a GTD tool, invest some time upfront learning about the features and thinking about how to organize it best for yourself, since it’s a manifestation of your individual brain.You can watch a thorough (27 min) tutorial here. There are lots of productivity tools out there, and the trick is to find the right one for you. Check out Pricata’s guide to choosing GTD software if you’d like to learn more. Hat-tip to Kerry Skinner and Tara Mospan for their assistance! This entry was posted in Computer Tips, Exams, Law Students on March 14, 2012 by Sara Lipich. Ever tried listening to audio podcasts? Even if you don’t consider yourself an auditory learner, you may develop an affinity for them. They are a great way to learn or catch up on news while you work, drive, exercise, or maybe even while you sleep. It’s easy to listen online or to download them to a portable media player, and you can subscribe to podcast channels using RSS feeds so you never miss a new episode. 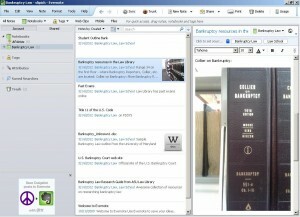 This entry was posted in Blogs & News Feeds, Computer Tips, Legal News on September 7, 2011 by Sara Lipich.